A home that is extremely energy efficient with a budget. The cients needed space for homescooling the children, an open together area, and smaller private spaces for study. They love to play piano music and enjoy processing their own garden produce. To me this is the ideal project. Arrangements were made to visit the property. No high mountain view, but the building site did overlook a nice garden spot with a beautiful forest beyond. We picked out a good south facing spot for the house. The ground was pretty steep, so we needed to keep the house long and narrow. They wanted the house way up the slope, but I suggested moving it downhill about 40 feet. Being up higher would have increased the view, but the clients liked the convenience of being much closer to their garden spot, having less excavation costs, easier driving access, as well as having a smaller budget. 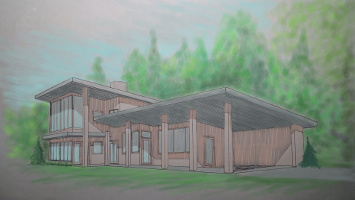 The carport was planned for the east end of the home, where the driveway will approach. There is an entry from the carport to the kitchen for the family's groceries. A door nearby opens into the mudroom- laundry area for convenient clean up of clothes, children, and garden produce. The kitchen has lots of work and storage space for a family that cooks and eats at home. The other side of the kitchen opens into a high ceiling great room with the acoustics to enjoy their real piano. A built in table extends from the kitchen counter, providing eating and group homeschooling space. Lots of shelves nearby store schooling items. Beyond the great room is a hallway leading to the master suite, and a stairway up to the children's bedrooms. The master suite is efficiently planned. So are the childrens' bedrooms. Placing the children's bathroom sinks outside the bathroom allows for one to be using the sink while another is taking a shower. An interesting feature of this home is a two story solarium. The south facing glass absorbs lots of winter sunshine, heating the air inside. By opening the doors and windows between the house and solarium, this heat flows through the house. The insulated concrete floor and walls absorb this heat, storing it for cold nights. This sytem is a big improvement for passive solar homes, providing temperature control. At the time of writing this, the plans are almost done, and construction will begin soon.